Størrelse af denne forhåndsvisning: 500 × 599 pixels. Andre opløsninger: 200 × 240 pixels | 401 × 480 pixels | 651 × 780 pixels. 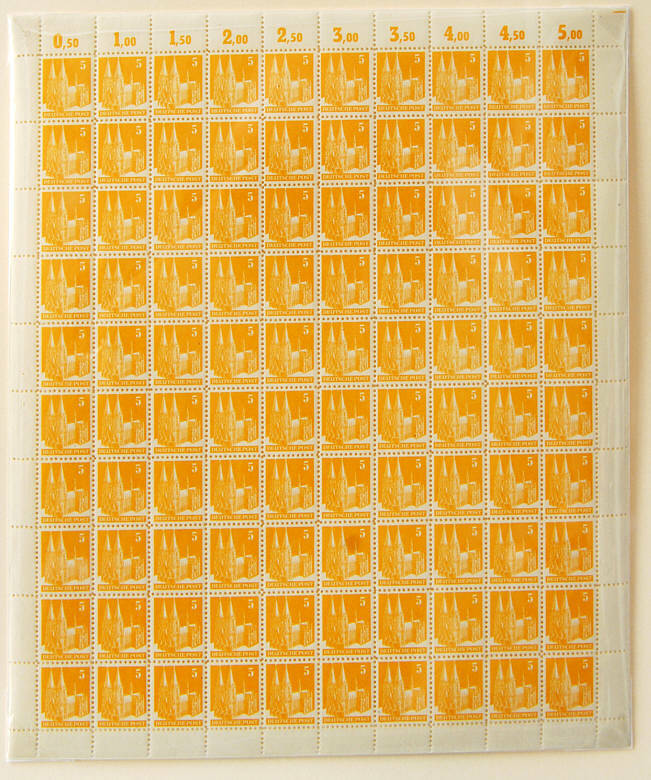 English: Yellow Cathedral, a sheet of 100 unissued 5-Pfennig stamps produced by the Deutsche Post in 1948 in the American and British Occupation Zones of Germany, displayed at the Cologne fair 'Philatelie und MünzExpo' (Philately and Coin Exposition) between September 20 to 22, 2007. Deutsch: Gelber Dom, eine nie ausgegebene Briefmarke der Deutschen Post, 1948. Der einzige vollständige Briefmarkenbogen, der erstmals vom 20. bis 22. September 2007 auf der Kölner Messe Philatelia und MünzExpo gezeigt wurde. Русский: «Жёлтый Кёльнский собор», не выпущенная почтовая марка послевоенной Германии (1948). Единственный сохранившийся лист из 100 жёлтых 5-пфенниговых марок был показан на Кёльнской выставке «Philatelia und MünzExpo» 20-22 сентября 2007 года. This work was published in Germany before the Law on Copyrights and Neighboring Rights (UrhG) came into effect on January 1, 1966. It does not indicate its author and was published by a legal entity under public law (§ 5 KUG; for details see Wikipedia:Bildrechte). Therefore according to § 134 Satz 2 UrhG, copyright expires 70 years after publishing. This work is not in the public domain in the United States because its copyright in the U.S. was restored by the URAA as it was still copyrighted in its source country on the URAA date (January 1 1996 in most cases but see Wikipedia:Non-U.S. copyrights for details). In most cases, it is copyrighted in the U.S. until 95 years after the year in which it was initially published (exceptions are works published after 1977; see Commons:Hirtle chart). Images whose copyright was restored in the U.S. by the URAA are no longer accepted at Wikimedia Commons. New files should not be uploaded with this tag, or they will be deleted. A review of files is currently underway to verify that this template has been applied correctly to existing files. Files that are copyrighted in the US and that have not been released under a free license will be deleted. If you are the copyright holder of this file, and do not wish to have it hosted on Commons, please contact our designated agent or nominate the file for deletion, explaining the situation.